Find your most comfortable position, whether you are sleeping or up late on your laptop. Personalize your sleep experience. Find your perfect sleeping position, and get the best night’s sleep of your life, with an adjustable bed. Make small adjustments to the angles of your upper and lower body via remote. Many people find it easier to sleep in a position that is just slightly altered from the flat position. Beds aren’t just for sleeping! Adjust your bed to enjoy the most comfortable position for reading, watching TV, working on your laptop, snacking, and relaxing in bed. An adjustable bed also gives you the freedom to adjust your side of the bed without disturbing your partner on the other side; for example, if you want to stay up late, reading, and your partner wants to sleep. Adjustable beds also provide many health benefits: they can help ease chronic back pain, they can reduce snoring, and they can ease leg pain caused by swelling. Mattress Traditions in Arlington, Virginia carries a wide variety of adjustable beds from basic models to top-of-the-line models with dual massage, wave, memory, wall-hugger feature, anti-snore feature and power outage battery-backup. An adjustable bed can be free-standing, used with a headboard, or in many cases be used with an existing bed frame. Most of our mattresses are compatible with adjustable bases. See how affordable it can be to upgrade your mattress to an adjustable bed set. 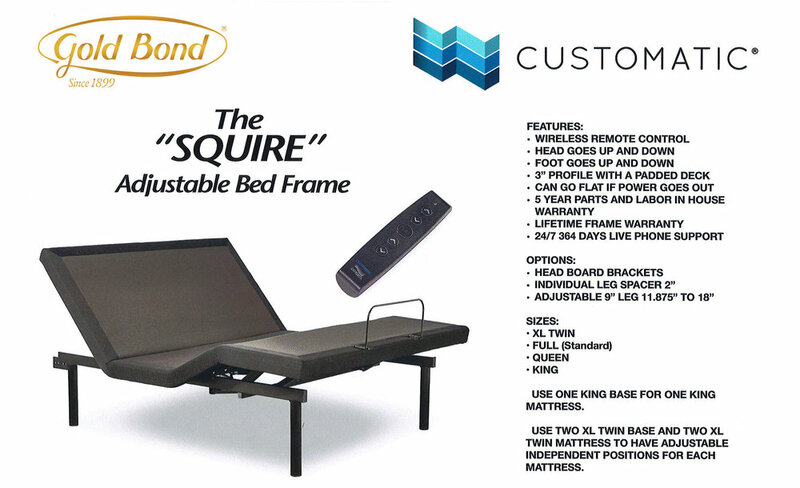 Call today - we will be happy to speak with you about any of our adjustable bed products.